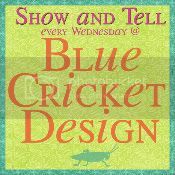 This post is part of a month long series called 'Pattern Makeover Month.' I took a simple pattern (The Sweet Dress by Leila and Ben) and 'made-it-over' into many different styles. For more information, go here. How about this sassy little version? Cut this dress as directed in the pattern, adding about 1/2 an inch above the neckline. Do not cut sleeves. 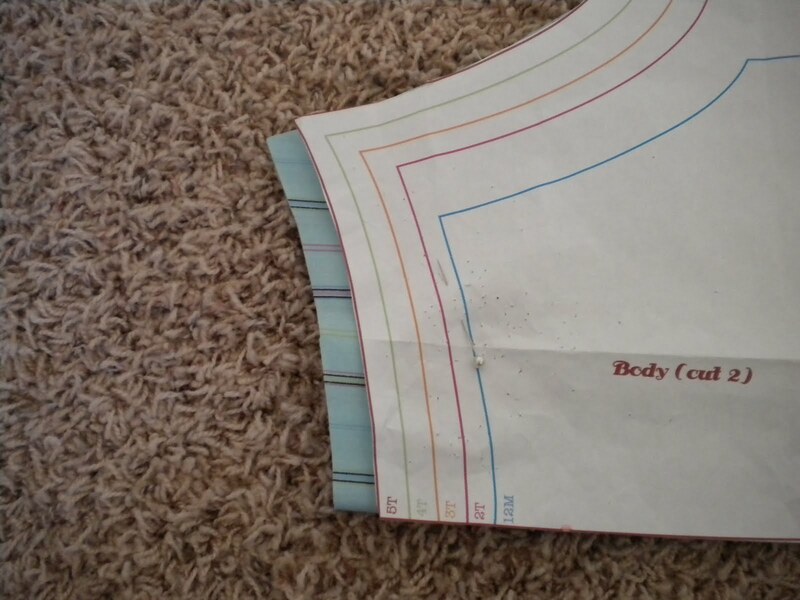 Sew your side seams on both sides. Iron the armholes in 1/4 inch, twice. Stitch around both armholes, making a rolled hem edge. Instead of gathering this dress at the neckline, I made pleats. And I found that the easiest way to make pleats is by using striped fabric! Take three pleats on each side of the center line on the front and back. Each pleat should be about 1/2 inch. Pin each pleat. Baste the pleats 1/4 inch from the neckline. Cut two pieces of double-fold bias tape 25 inches. 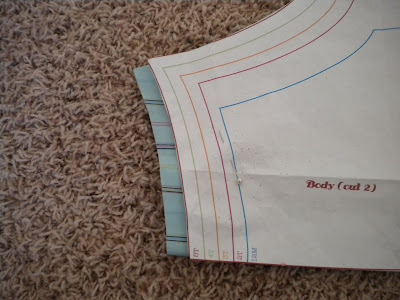 Find the middle of your bias tape and place it over the midpoint of the neckline. 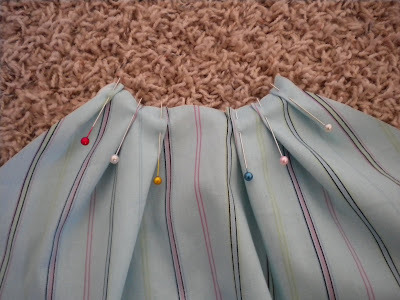 Finish the hem with bias tape. I also added a little bias tape bow to the hemline. You can also finish the ends of your bias tape by sewing it closed or you can cheat-- like me! Just use Fray-Check or clear nailpolish to seal the ends. Add a belt to finish the look. Just a few more days. . .
Definitly up there with one of my favorites! 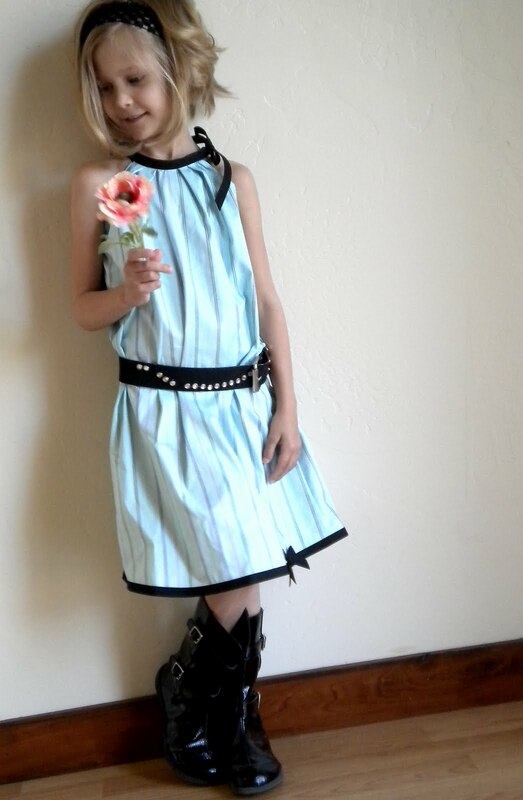 I love the colors on this dress and the details at the neckline are adorable. Love the color and details on this one! Good work! I LOVE that one!!!! Super cute!! Adorable, love the look and the boots are perfect with this! 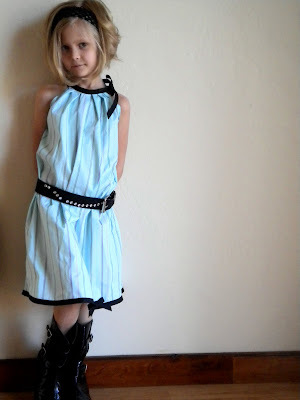 I so wished that I looked as cute as your little girls in something like that.... Super cute! Hey that's my maiden name!! More along the line of James,not Marilyn, ha ha! Love the colors! Wow, I absolutely LOVE it! The pleating at the neckline is my favorite part, so stinkin' cute! What a cute one!!! I love it and love the colors, yet again!! Striking color combination! This is very stylish - your model looks so cool. Ooooh! ME, ME!!!! I want the pattern. I have 3 girls (including twins just about the age of the adorable model in the picture) Please please please PRETTY please! Oh wow this is gorgeous!! Might be my favorite!! I loved this! I hope you don't mind but I linked to your post after doing a similar ribbon collar on my dress. So CUTE!! I love the sassy look. First off, she is just precious!! And the dress just adds to that! I love it! Thanks for linking up! Hi new here. Great blog! I just wanted to put in my two cents. After looking at The Sweet Dress Pattern I realized it is very similar to Simplicity 5695 view D with out the ruffle. This look could be done with this pattern as well! Okay, now I am off to try it.